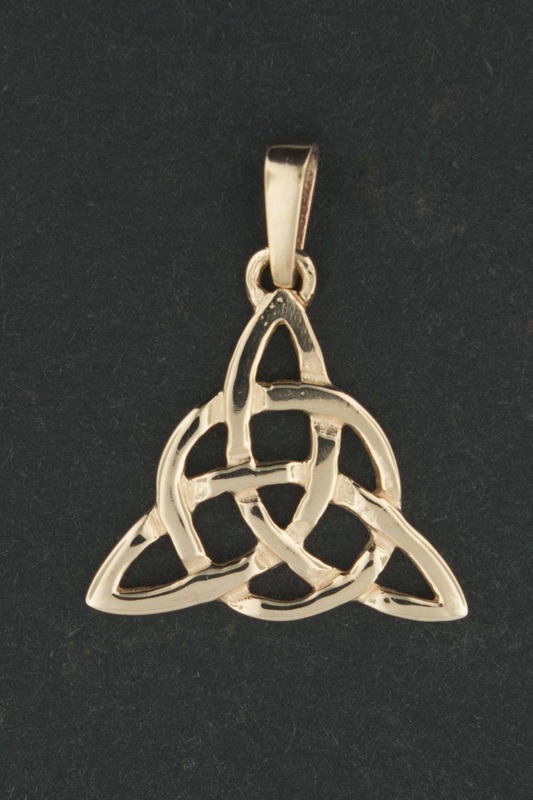 This is a handmade antique bronze triquetra pendant I made based on the triquetra pendant from Charmed. I wanted to make a pendant that was sizable enough both men & men could wear it! The pendant is 2cm long, 2cm wide, and is made nice and solid so can be worn every day. The bail is large enough to pass a 3mm chain. I also make this in a smaller format as well. Triquetra (Latin tri- "three" and quetrus "cornered") originally meant "triangle" and was used to refer to various three-cornered shapes. It has come to refer exclusively to a particular more complicated shape formed of three vesicae piscis (the leaf-like shape in between two equal diameter circles when both centers are on the circumference of the other circle), sometimes with an added circle in or around the three lobes. Also known as a "trinity knot" when parallel doubled-lines are in the graph, the design is used as a religious symbol adapted from ancient Pagan Celtic images by Christianity, as is common in Christianity. It is similar to Odin's symbol, the valknut.